I was inspired to write this post based off how I currently feel on this cold, foggy day. I’m working from home, and I want nothing more than to cuddle up with my dogs and hibernate. However, that’s not an option as work has to be done. So, what do I do to motivate myself? Here are some tips that work for me, so if you can relate to what I’m saying, please try these suggestions out! Our brains are made up of about 60% fat and need fat to promote clear thinking and focus. Outdated research suggested people stay away from products containing fat, so for me growing up I typically ate fat-free products. I can’t tell you how relieved I am to now know that healthy fats are actually an essential part of our diet. Foods like avocado, salmon, coconut oil, organic grass-fed butter and egg yolks are all examples of healthy fats that most people should consume on a daily basis. I personally don’t eat much dairy, but it makes me sad that I deprived myself of the delicious goodness that is whole milk and 2% Greek yogurt for so many years. Fat-free products not only taste unsatisfying, but they are typically packed with preservatives and hidden sugars in attempt to improve flavor. By eating more fat, especially earlier in the day, you can power your brain, enhance learning and memory, and protect yourself again future brain diseases. Breakfast — Two eggs fried in either ghee or coconut oil with vegetables sautéd in either coconut oil or olive oil over rice. Lunch — Mixed green salad with avocado and a little olive oil with lemon and lime for dressing. Snack — Apple with almond butter. Dinner — Baked salmon with steamed broccoli over quinoa. Fat sources for the day = chia seeds, hemp seeds, egg yolks, ghee, coconut oil, avocado, olive oil, almond butter and salmon. If you focus on eating whole foods, it’s not so hard to get your daily fat! Aromatherapy has been used for thousands of years to improve mood, aid with sleep, energize, fight disease, and so much more. There’s pretty much an essential oil for just about anything you can think of. For me, after years of taking pharmaceuticals to manage ADHD, essential oils, in addition to diet, have become my all-natural solution for staying focused. There are different oils you can use, and there are also oils made of a combination of different scents. My absolute favorite oil is by DoTerra and it’s called InTune. It’s a combination of several oils, but it’s my go-to scent whenever it’s time to get working. Other oils that work well, which are mostly found in InTune, are lavender, Roman chamomile, mandarin, ylang ylang (I love this scent! ), frankincense (I love this one too! ), vetiver, and patchouli. This recommendation might sound counterintuitive and also may not be a solution for everyone. For me, I have found with certain strains of cannabis that I can manage my ADHD-tendencies. I do live in California where just about anyone can get a medical marijuana card, so apologies to those of you who unfortunately don’t have access to legal medicine. For those of you who do, certain strains can actually give you clarity, laser-sharp focus, and can get those creative juices flowing. Of course, it’s always important to consult your doctor or bud tender first, since they will be able to recommend the best strains for your specific needs, but definitely ask if cannabis can be a good solution for you too. There’s something about writing out your daily to-do list that makes it much easier to get work done during the day. I think it’s because lists hold you accountable and help with time management. I actually prefer to write my list the night before, so that I can know exactly what needs to be done when I wake up the following day. The other part of goal setting, especially when you’re feeling unmotivated, is to set what I call “power hour” goals. It doesn’t necessarily need to be an hour, but what I’ll do is set a timer for typically about 20-30 minutes and during this time I have to stay completely focused on one task, like writing a blog post. When my timer goes off I then allow myself a five minute break to walk around and stretch. Sometimes on my break I even let myself check Facebook 🙂 The point is that this system forces my lazy brain to work hard with the promise of a reward. Because I get to take breaks I don’t get burnt out this way, not to mention I get in a little exercise! For more tips like these, please leave a comment or drop me a line on my website. Let’s talk! 75%-90% of all doctor visits are stress related. When stress goes untreated it suppresses the body’s immune system and ultimately manifests as illness. Poor nutrition, environment, career, unhealthy relationships, and lifestyle can all impact your body by releasing cortisol, the body’s stress hormone. While it’s normal to release cortisol, it’s important for your body to return to its normal cortisol levels following a stressful event. In our high-stress culture though, your body doesn’t always have the chance to return to its normal cortisol levels, so your body is constantly in fight or flight mode which makes you more prone to several negative effects. You’re busy and have tons to juggle. Writing things down, creating lists, and prioritizing tasks is one of the quickest fixes for reducing daily stress. I recommend keeping a list of everything you need to get done for the day, then reorganizing these tasks in order of importance. I also suggest completing the least exciting or hardest task before 11:00am. Our willpower and focus is only good for so long, so put your energy towards finishing the most stressful work for the day earlier on. That way by 11am you can take a big sigh of relief, because the rest of the day just got easier. 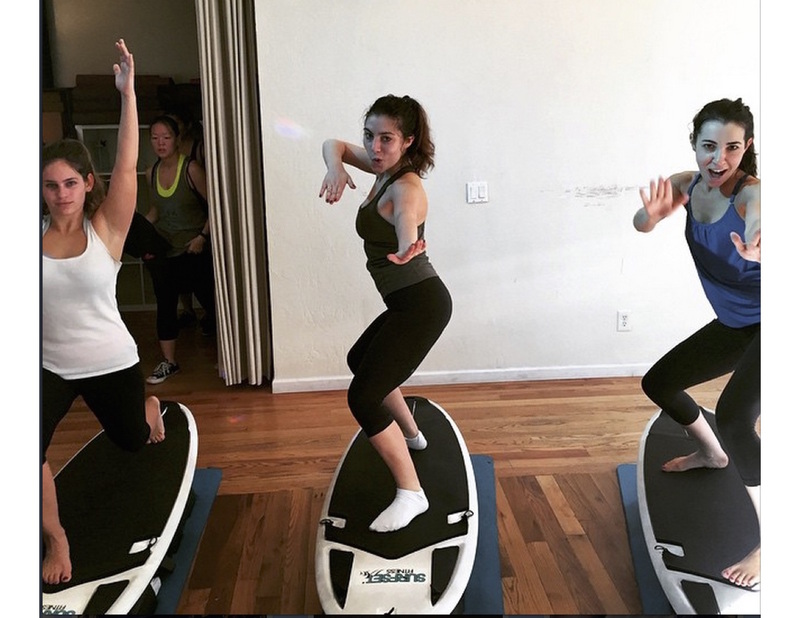 Early morning surfset with my girls! Our bodies crave movement. Find something you have fun doing and make it part of your daily routine. Exercise is a way of releasing built up tension, so instead of reaching for the sugar and booze, get your body moving if you’re stressed. It doesn’t have to be an intense workout. Get off the subway a little early and walk the rest of the way to work, or take a work break to stand up and stretch at your desk. You’ll feel much better! Find a type of exercise that works for your body’s needs. What did you like to do as a kid? What makes you feel good? Do you ever experience moments where you realize that you haven’t been breathing? I mean, really breathing, like from the belly. Start breathing consciously. Slow your breath down and allow your body to relax for a moment. Can you see your belly moving in and out or are you just breathing through your nose? Breathe in for four counts and out for four counts, breathing through the belly. Loving touch is so important to our mental health. We crave affection and not all of us get it on a regular basis. Give yourself some love. Try massaging yourself. Do you have tension in your shoulders? Your temples? Your neck? Breathe consciously and use your hands to make yourself feel good! Essential oils have been used for centuries for healing. Lavender oil has many therapeutic effects, and it’s a personal favorite for relaxing the mind and body and reducing stress. Poor sleep is often a result of stress, so lavender oil is especially useful at night before bed. I like to put a couple drops on my hands to rub over my pillows. I’ll also put a couple drops on the back of my neck to relieve tension, and there are tons of other uses and methods for applying lavender oil. Want more tips like these? Subscribe to my newsletters or contact me for a complimentary health consultation.